Have you ever heard of a SCOBY? Do you hide anything in a cupboard to let it ferment? Do ever open a cupboard and get a whiff of vinegar stench? Well, if you go into our kitchen and open the cupboard where we keep our large pots, our blender and the Cuisinart, then that is exactly what you will get. Since we have so many people who like to drink the Kombucha, we make it in mass quantities. Not all of us drink it, but the half of us that do, love it and drink a lot... Well, we usually love it... Sometimes we have that bad batch that is so sour that we can't even drink it. Last time we made it, we let it ferment for way too long and couldn't drink it. So for me, it feels like forever since I had a glass. But still, even if I did this on my own, Kombucha is cheap and easy to make! It involves a SCOBY, green tea and lots of sugar. The SCOBY is the interesting part. 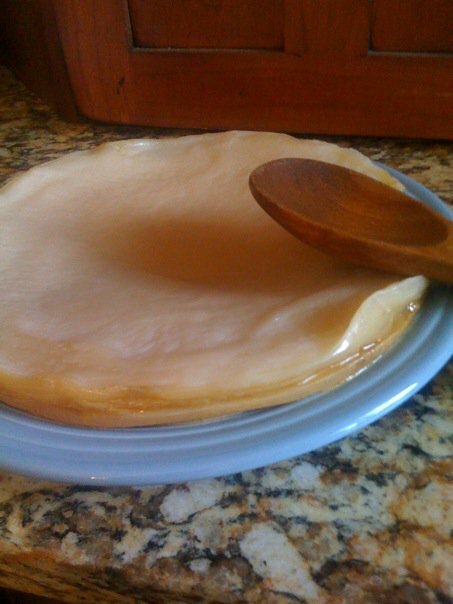 The SCOBY is a Symbiotic culture of bacteria and yeast. Yes, the main ingredient for one of the healthiest drinks out there is bacteria! It floats on top of the two gallons of green tea and feeds off the sugar, and that is what ferments the tea. It is the cause of the transformation from sweet tea to Kombucha. Why do we drink Kombucha? But what really got us into it in the beginning, were the health benefits. I started drinking Kombucha when I moved back home after college. If you drink it before a meal, it helps with digestion. This definitely assisted me in losing a few of those extra college pounds. Digestion, weight loss, immune support, detoxification and energy boosting are among the benefits. According to the government, there is a negative. When Kombucha ferments, eventually traces of alcohol can be found. When the Kombucha is made and put in bottles, it still is fermenting. It ferments on the shelves slowly. Last summer Kombucha was temporarily taken off the shelves completely. Lindsay Lohan used it as an excuse for why she had alcohol in her system. Surprise, surprise.